If you are currently in the process of choosing a thermal camera, you’ll need to decide between cooled and uncooled detectors and consider a lot of technical specifications such as sensitivity and resolution. This and following posts in our series should give you a good insight on the main differences between the two systems and help you make an informed purchasing decision. First, let’s take a look at the internal construction and workings of each system in turn. A modern cooled thermal imaging camera consists of an imaging sensor (or detector), electronics for interfacing and on-board image processing, optionally a zoom lens, and a cryocooler. The function of the latter is to reduce the sensor temperature to cryogenic values, which is usually around -200°C (-328F). Without cooling, these sensors (which detect and convert light in much the same way as common digital cameras, but are made of different materials) would be “blinded” or flooded by their own radiation. It must be noted here that cryocoolers have moving components which wear out over time. Typically, one should provide 8,000-10,000 hours of operation. Cooled systems are highly sensitive and can detect the slightest temperature variations (<20 mK). They typically operate in mid-wave infrared (3μ-5μ) wavelengths (MWIR), but can be designed to enable imaging in the long-wave infrared (LWIR) band of the spectrum. Cooled thermal cameras are the most sensitive class of cameras on the market today. These systems provide better detection capabilities and are ideal for mid to long-range detection applications. The more compact cooled thermal camera are ideal for gimbals, security and surveillance products and thermal weapon sights. The main downsides of cooled cameras are high maintenance costs and more downtime for service, and relatively higher prices. An uncooled infrared camera does not use a detector with cryogenic cooling. Its detector design is based on a microbolometer – a tiny resistor on a silicon element with large surface area, low heat capacity, and good thermal isolation. Bolometers are essentially resistance thermometers arranged for response to radiation. Changes in scene temperature cause changes in the bolometer temperature which are converted to electrical signals and processed into an image. These bolometer-based uncooled sensors are typically designed to work in the longwave infrared (LWIR) band (7μ-14μ). Because of this, these systems offer better penetration in poor environmental conditions like those of dust, fog, and smoke. It is cheaper to manufacture these sensors, they require less expensive vacuum packaging, and do not require very costly cryocoolers. They also have lower power consumption. Another advantage is that uncooled cameras have fewer moving parts and therefore have much longer service lives and will work continuously for years without maintenance. Cooled systems typically feature single-photon counting detectors containing all the electronics necessary to detect single photons with picosecond accuracy. Photon detectors release electric charges in response to incident radiation. For such detectors a single photon is enough to create an electric signal which will be represented on a screen. Whereas, uncooled detectors require a mass of photons in order to create a detectable signal. That’s the reason why cooled detectors offer higher sensitivity. Let’s take a look at a couple specific metrics that you should consider when selecting a thermal camera. The sensitivity of a thermal detector is defined by its Noise Equivalent Temperature Difference (NETD) aka Noise Equivalent Differential Temperature (NEDT). NETD is the temperature difference between an object and its environment required to generate a variation of the IR camera signal equal to its temporal noise. It can be considered as the thermal resolution of an IR camera. The lower the NETD value, the better. Typically, uncooled bolometric detectors have NETD of 30-200 mK. While cooled photon detecting IR detectors can approach a NETD value of 10 mK. Minimum resolvable temperature difference (MRTD) is one more metric that is used to determine the capabilities of a thermal camera. MRTD is a test developed by the US Department of Defense, and is now the most widely used parameter for measuring the performance of an IR camera. It determines the camera’s ability to discern the minimum level of thermal sensitivity that an operator of the camera can see. Measured in degrees Celsius. The lower MRTD, the better. One of the benefits of the microbolometer, besides the elimination of the cryogenic cooler, is that the detectors are responsive to energy in the longer wavelengths, typically 7.5 to 12µm. This means that manufacturers can produce long-wave, focal-plane-array devices at a more reasonable prices. Ironically, the inherent lower cost as a result of the elimination of the cooling system is counteracted by the cost of system optics (something we will look at in future installments of this series). 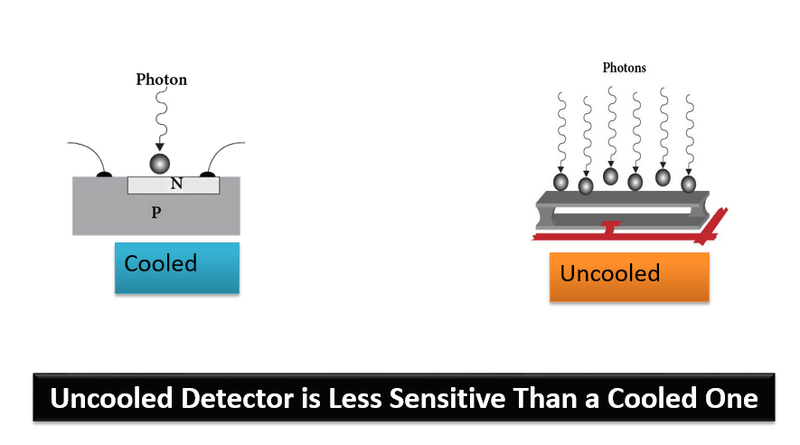 Though cooling requirement is a significant disadvantage in the use of photon (cooled) detectors, their superior sensitivity over bolometer-based ones still makes them the detector of choice for many thermal imaging applications. Additionally, the greater sensitivity of cooled cameras also allows for the use of higher F-number lenses, making high performance long focal length lenses both smaller and cheaper for cooled detectors. However, modern micro-machining technology has allowed for production of thermal detectors with arrays of microscopic elements (pixels) which have response times similar to those of photon detectors. Moreover, there have been studies recently that suggest that an NETD has only limited value as a sensitivity metric and that microbolometers are able to provide high-fidelity measurements of a type traditionally associated only with cooled IR imagers. As this technology is still in its infancy, technical challenges still arise which inevitably delay the cost savings to the end user. So you want to watch out for such products on the market when they become available.